Looking to add a little friendly competition into your next family movie night? 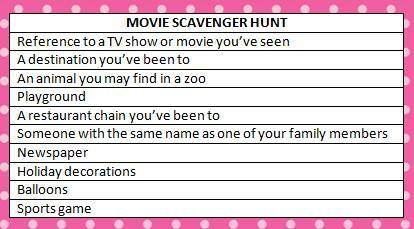 Then check out this movie scavenger hunt idea! This free printable movie scavenger hunt tests your ability to look at the close details in movies – how close are you paying attention? The kids will have fun watching for special movie scavenger hunt items during your next family movie night. You could say that the first person to find each item wins a small prize or the person with the most items found at the end of the game wins. The kids can just shout out the items as they see them in the movie. Your small prizes could be small sized chocolate bars or candy for their movie night snack bucket. The kids can also be part of the game creating fun. Before watching a movie, have them brainstorm scavenger hunt items to find in the movie. Perhaps it’s a movie they are quite familiar with but the parents aren’t – they can create a movie scavenger hunt for you to try to stump you while watching one of their favorite movies. Another idea is for them to write down a few questions for your to answer during the movie – like the name of a character’s pet or school. They can also be creative in thinking of fun prizes to award to you when you guess the correct answers. Looking for some delicious movie snack ideas? Here are recipes for 2 of my favorite dips – Turkey Taco Dip and Hot Spinach & Artichoke Dip. Have a sweet tooth? Then you’ll love this Chocolate Caramel Skor Cake – but just to warn you, you won’t be able to stop with just one piece! Looking for other fun ways to add a little friendly competition into family movie date night? Check out our page full of free printable games. Does your family have regular movie date nights? Do you usually rent a new movie or watch your favorites over and over again? Don’t forget to follow us on Facebook, Twitter, Pinterest and Bloglovin’ for the latest ideas and freebies. Great idea! We usually rent a new movie on movie night. Popped in from SITS! That’s so fun! I’ve never tried that! What a cool ideal! I would have never thought of this!